PRO TOY is conveniently located in the heart of Knox County on Pellissippi Parkway at Lovell Road. From the moment you walk through the front door of PRO TOY’s 6,000 square foot facility you realize this isn’t an ordinary “car repair shop”. Our goal was to make you feel at home and part of the family. We added comforts of home instead of bombarding your senses with logos, signs and flyers. Not giving all the details, we want you to see for yourself. We will tell you that PRO TOY is clean, (even the restrooms) comfortable and inviting. 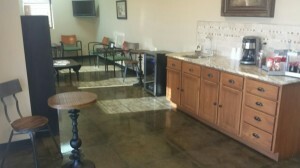 We offer free coffee and bottled water as well as free Wi-Fi and current magazines in case you decide to stay. Our technicians enjoy a spacious 8 bay facility with state of the art equipment. We stay in stride with advancing technologies to keep up with the ever changing automotive industry. Their areas stay clean and organized so your vehicle will receive the best attention in the business.